Hello! I hope you are enjoying your weekend! I've been cleaning and reorganizing my craft room yet again. I was overdue! As I was cleaning, I came across this Pure Innocence Li'l Pumpkin and decided to take a break and make a card with her. My card is fairly simple.. I used Karen's Sweet Sunday Sketch #90 for my layout. I colored her with Copic markers and paired her with some Echo Park Happy Halloween paper. I am also well overdue for blog candy! My 2 year blogoversary was last month, and somehow it came and went. I do have a couple of Papertrey Ink Round & Round anniversary stamp sets available. If you are interested, please leave a comment on this post. I will draw 2 random winners on Thursday, 10/28! Accessories: Standard Rectangle Nestabilities-LG (Spellbinders), Die-namics Scalloped Scallop die (MFT), Foam tape, Thread, Sewing machine. She is as sweet as can be Steph! LOVE your coloring and the FUN paper!!! Happy Blogaversary. I am a very happy subscriber to your blog through google reader--that way I don't miss a post. I just love this image. I too have some of the Echo Park Halloween paper and have used it several times. Thanks for the chance to win. Beautiful card!! Happy Blogoversary and thanks for the chance to win! Not here to win anything Stephanie just here to tell you how darling this card is! Love the fun color combo & that lil girl is oh so sweet! Adorable! Love the scalloped border your colouring is fabulous! What a great card! The background paper and the stamp are so cute! I subscribe so I get to see all your cards and as usual. love this one. Thanks for the chance at blog candy! Isn't she cute - love that little heart on her skirt. Happy Anniversary, Stephanie, and thanks for the chance at the candy! Adorable! Love those pure innocence images and you really made her shine! Sweet card. Happy Blogoversary!! 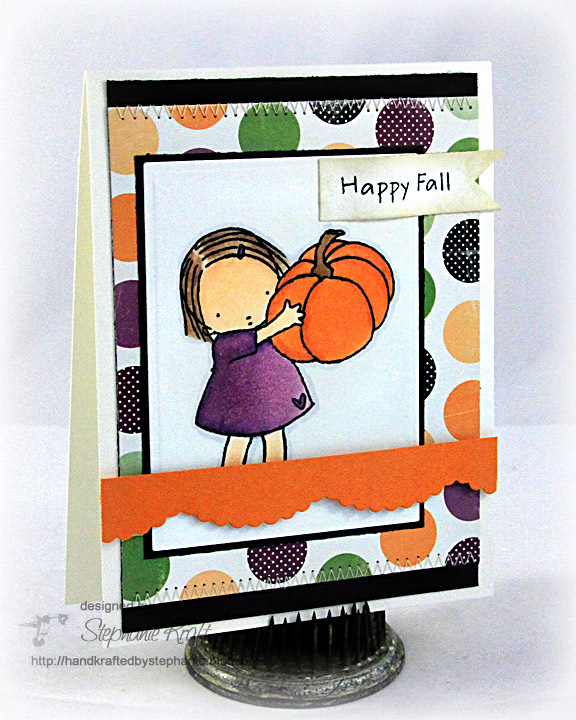 I am lovin' your little pumpkin card!! Too cute! !